Are you looking for a unique mind capable of sprouting out fresh ideas that can fuel your company’s marketing? Most often, all you will need is one or two key people who are creative enough to actually produce quality marketing campaigns that can grow your business to next level. The key is in selecting the creative bunches who have the ability to think outside of the box and innovate traditional marketing techniques. Producing quality marketing output starts with the hiring process; your company must be able to acquire the best individual possible to steer your company’s marketing direction in the right place and in this article, we can reveal to you one simple secret that can help you in choosing that one person you need to actually stir up the marketing game of your company and change it for the better. Start by giving your prospective hire a hypothetical scenario that aims to gauge his marketing skills. Although these may seem like very logical and obvious answers, these techniques don’t necessarily espouse creativity or innovation. Remember, when choosing a great marketer, you’ll want that person to think differently than others. 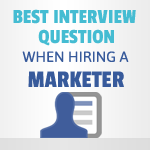 Traditional answers like this will most likely give your company traditional results as well. These are better answers but they aren’t necessarily game-changing ideas. As mentioned previously, once all these ideas and suggestions are exhausted, there will be nothing left for to improve on. The reason why these answers are the best kinds is because it just goes to show that the people who respond this way don’t just jump into the conclusion and marketing tactics. They try to critically assess what it is they are trying to sell, and develop a foundation for marketing strategy from there. It is by asking even the smallest questions wherein people can draw out the biggest pictures. Getting to the root cores of an issue are the best ways to address them. The only way to gain access to these root cores are by continually asking questions. Deductive reasoning is always a great way to start developing new ideas. When people ask more questions, that means that they have the tendency to think outside the box more often, and that they aren’t subject to dogmatic and traditional ways of going about things. Routine will always breed familiarity. However, in marketing, creativity will always breed interest.